I have always been fascinated by the lives of explorers, those individuals with the courage to go beyond — to venture into uncharted regions, to lose sight of the shore, and to think outside the box. One of my favorite historical periods is the Heroic Age of Antarctic Exploration, the period from 1897–1922 during which sixteen major expeditions from eight countries focused on the Antarctic continent. That twenty-five year period is characterized by some remarkable individuals who led scientific expeditions and who made attempts to reach the South Pole. Ernest Shackelton is among my favorites. His trans-Antarctic expedition was the most successful failure in history until the near-tragic Apollo 13 space mission. Shackelton’s story is nothing short of amazing and inspirational. It was the Apollo 13 story of his day. Amundsen at the South Pole in 1911. One-hundred years ago, the Norwegian explorer Roald Amundsen and the British explorer Robert F. Scott led their respective expeditions to Antarctica in an attempt to reach the South Pole. 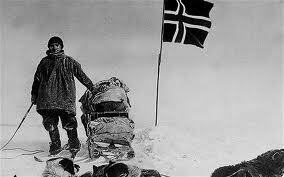 On December 14 of 1911, Amundsen arrived at the pole a month before Scott and then returned safely to his base camp in late January. Sadly, Scott’s expedition was less fortunate. Scott and his companions died on their return journey only eleven miles from their base camp. After his historic Antarctic journey, Amundsen attempted to become the first explorer to fly over the North Pole. However, American explorer Richard E. Byrd claimed that title (later disputed) three days before Amundsen passed over the pole in a dirigible. Amundsen died in 1928 while attempting to rescue a fellow explorer whose dirigible had crashed in the Barents Sea near Spitsbergen, Norway. Cernan on the Moon in 1972. We owe much to intrepid explorers like Amundsen who ventured to inhospitable places like Antarctica to gather scientific data and to help us understand more about our planet — the place we all call home. 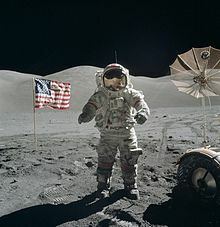 As we remember Amundesn’s accomplishment one-hundred years ago on this day, remember also that this day marks the last time that man ventured to the moon aboard Apollo 17 in 1972. Eugene Cernan was the last man to walk on the moon and a reminder that as long as there are unexplored places and things to be learned, people like Amundsen and Cernan will continue to go beyond. As Christ-followers, we too must demonstrate the courage of explorers by going beyond — stepping across the line that defines the farthest we’ve ever been and the most we’ve ever done for God and His purposes. Only then will the kingdom of God advance and will we move closer to the day when “the earth will be full of the knowledge of God as the waters cover the sea” (Isa. 11:9).